We'll respond within 5 business days to any concerns. Isle au Haut Boat Services is committed to compliance with Title VI of the Civil Rights Act of 1964. We are grateful to Kristin Collins of the Island Institute for the design of our website, to Peter Ralston for the use of his copyrighted photographs, and to Stuart West of the National Park Service for the use of his photographs. 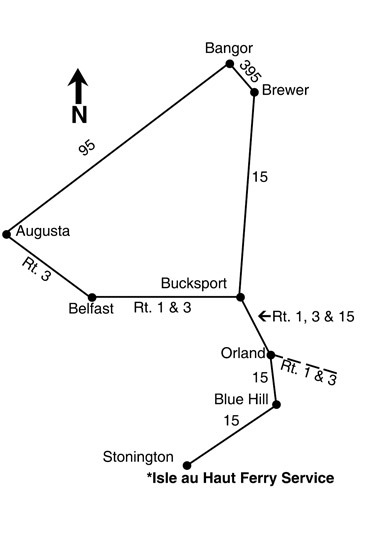 From Points South - take Interstate 295 and 95 to Augusta, pick up Rte. 3 to Belfast, and then take Rte. 1 & 3 east through Bucksport to Orland, follow Rte. 15 south to Stonington. From Points North - take 95 to Bangor then 395 to Brewer, then take Rte. 15 south to Stonington.